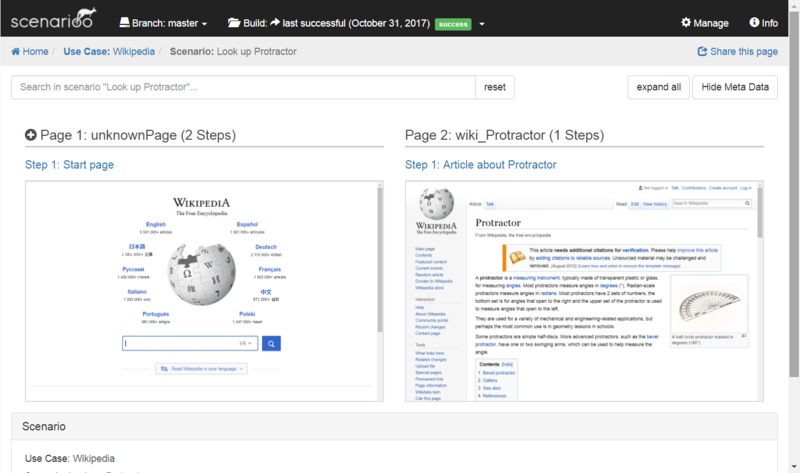 The aim of this page is to describe the minimal viable setup of Scenarioo from scratch using protractor and the scenarioo-js writer library. Open the folder in a console. Disclaimer: we are using the legacy (plain Jasmine) syntax for this example to keep it as simple as possible. We recommend using the Scenarioo Fluent DSL instead, as it has many advantages. Download the latest Scenarioo development build. (This is currently required because the released version does not have the simple configuration option we use here yet). Move Scenarioo *.war file into webapps folder of Tomcat and rename it to scenarioo.war. Start up Tomcat using the startup script (startup.bat or startup.sh depending on your platform). If you can&apos;t access this page, make sure no other application is using port 8080.